My Life as a Dog: MobileMe - It Works! Friday night I had a moment of panic. I had been out to a restaurant with some friends and when I got home I could not find my iPhone any place. I searched and searched retracing my steps upon getting home. I called the restaurant to see if I had left it there. I was going a little crazy. One of my friends said, "Well you have Find My iPhone set up right?" Oh yeah! 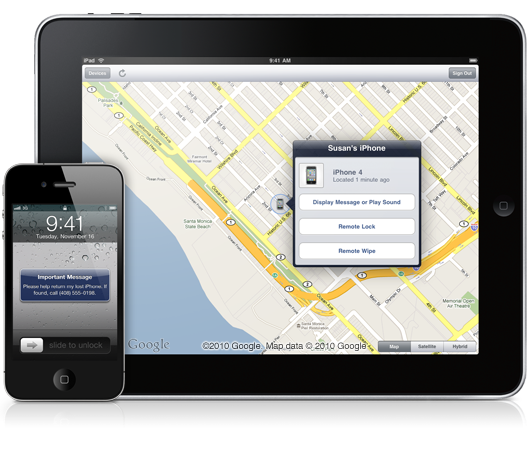 "Find My iPhone lets you easily locate a misplaced iPad, iPhone, or iPod touch on a map. You can also have your device play a sound and display a message to help someone return it to you, or you can remotely lock its screen or wipe all of its data to protect your privacy. To locate a missing device, just use the free Find My iPhone app on any other iOS device, or use Find My iPhone at me.com from any computer web browser." So I logged in and located my phone in my friends car in the parking lot. I made my phone play a sound and display a message because I had already looked in the car once. This time I found it! Thanks Apple! I will SO be doing this... thanks for the info!